The Motorola Shadow just seems to be popping up everywhere these days! First it was the phone guide, then in a gym, again on the Howard Forums, and today in an app called Quadrant which is used for benchmarking devices. 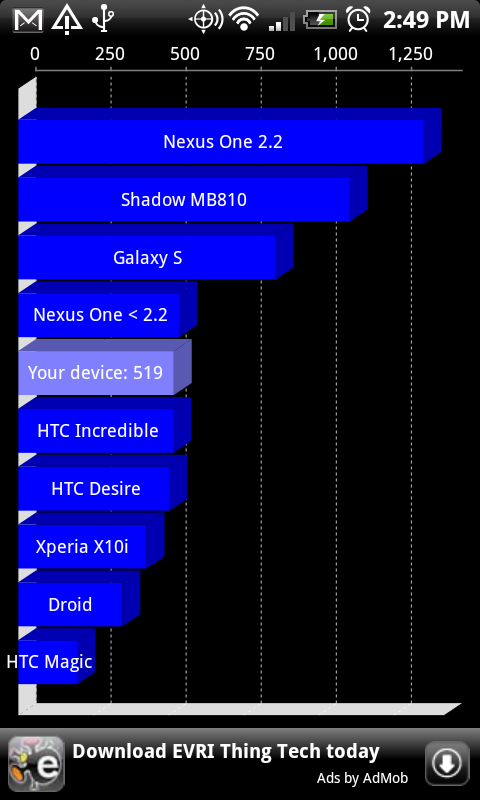 If you take a look at the photo I just capped after benchmarking my Incredible, you’ll see the Shadow(MB810) clocking in just below a Nexus One running Android 2.2. Crazy right? We’ve been hearing all along that the Shadow would launch with 2.1 and Motoblur, but do these numbers make it look more like 2.2? Maybe it’s just going to be more of a beast than we had imagined?